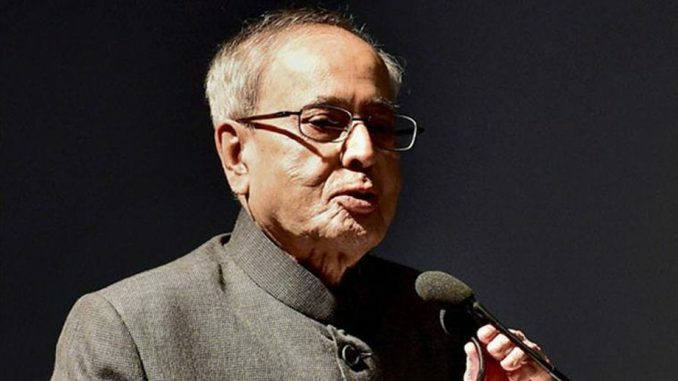 Kolkata : Observing that India is a signatory to the Paris Agreement and is committed to have a specific rate of reduction in carbon emission over the years, President Pranab Mukherjee on Friday cautioned against harming the environment to meet energy requirements. Mukherjee inaugurated a Bio-Solar-Wind Microgrid Centre and Centre for Water and Environment Research at the Indian Institute of Engineering Science & Technology (IIEST), Shibpur, West Bengal, during the day. The President said the facilities inaugurated on Friday — Integrated Bio-Solar-Wind Micro-grid centre and Centre for Water and Environment Research — are crucial from the perspective of socio-economic development. “Centres such as these are the need of the hour, with resource sustainability and environmental protection having become pressing global issues,” he said. Mukherjee said that in present circumstances, energy availability has become uncertain with augmentation in power generation capacity unable to meet the rising demand for power of various consuming centres such as industry and household. “A micro-management of power system using renewable energy sources will lead to self-sufficiency in high consuming destinations like institutions and industry. The integrated Bio-Solar-Wind micro-grid centre of IIEST is one cog in the wheel of sustainable development. We must ensure that electricity is available for ordinary people and potable water is provided for consumption of both humans and animals. “For this, our knowledge and expertise has to be implemented in finding practical solutions to problems in our day to day life,” he said. He appreciated the innovations displayed by a large number of grassroot innovators during the annual Festival of Innovations at Rashtrapati Bhavan. The President said a large population of this country has no access to any form of electricity. “However, we must ensure that we do not harm the environment to meet our energy requirements. India is a signatory to the Paris Agreement and we are committed to have a specific rate of reduction in carbon emission over the years. “We must emphasise on renewable energy to ensure sustainable development. We as a nation have to work more intensely towards developing solutions for such important global challenges, which have wide import for a developing country with large population like ours,” he said. He also called for addressing the problems of potable water. “Access to water in the 21st century is a challenge. Potable water is not available to a large population in many villages in India. The demand for safe potable water is increasing rapidly with the exponential growth in population. This problem needs to be addressed,” he said.